The Delhi Metro is a metro system serving Delhi and its satellite cities of Faridabad, Gurgaon, Noida and Ghaziabad, and is the world’s 12th largest system in terms of both length and number of stations. It has a total length of 213 kilometers with 160 stations carrying a total of 24 lakh passengers per day in 2016. Today the Delhi Metro and the bus systems, together take care of over 60 per cent of the transportation needs of the city. Private vehicles, which occupy a major part of the road system, serve less than 15 per cent of the urban population. With the sanction of more and more new flyovers / grade separators and bridges, and badly planned junctions, this skewed system dominates the city, steadily reducing the space for pedestrians, creating increasingly chaotic conditions. When the first few phases of the metro system were planned there was little attempt to integrate it with the surroundings, and it was simply overlaid on the existing structure of the city. As a substantial part of this was underground, it did not initially cause any serious disturbance. However as the system has expanded, it is realized that a great deal of traffic congestion now occurs around some stations, particularly where major interchanges are located. Poor location with inadequate space for passengers at road level, are some of the contributing factors. This is a situation that calls for better planning around new metro stations currently being built, as well as for correction around existing stations. Let us take a look at a few locations. The Hauz Khas Metro station, on the Yellow line was opened in 2010. It is now being expanded as an interchange connecting to the Magenta line, which is to start operating shortly. 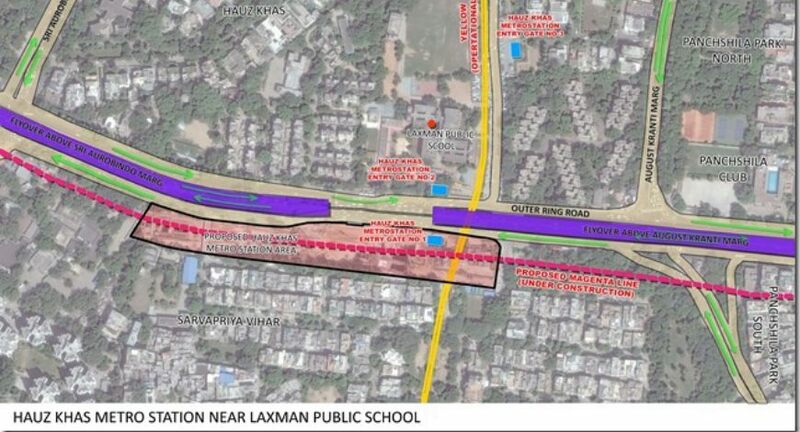 The station opens directly on to both sides of the Outer Ring Road near the Laxman Public School, and lies at the base of the flyover crossing Khelgaon Marg (see attached illustration). This station serves residents of a large area, which includes Hauz Khas, Sarvapriya Vihar, Panchshila Park and Shahpur Jat. Because of its poor location, near the base of two traffic flyovers, and its proximity to the Khelgaon Marg crossing, there is a virtual traffic jam at this point on the Outer Ring road throughout the day. Parked auto-rickshaws, taxis, and cars on both sides, create a bottleneck slowing all traffic. Conditions are bad for passengers entering and exiting from the station because of limited space around the entrances. The pedestrian sidewalks are narrow and inadequate. DMRC are presently in the process of expanding this station connecting it to the Magenta Line. The existing station has been in operation for more than ten years, and it can be seen that a large number of residents of Shahpur Jat and Malviya Nagar who have no proper access, have to scramble across the busy traffic intersection to get to the station. It is surprising to find that even today with the expansion of the station in progress, DMRC is not making any attempt to address this serious problem. With the station being entirely underground, suitable passenger tunnels could be built on either side of the Outer Ring road connecting directly to Panchshila Park North and South, to enable easy access. It is true that this would involve additional cost and land issues, but ultimately it is a matter of providing for the safety of a large number of human lives, and this should not be ignored. Further along the Outer Ring road from Hauz Khas along the Magenta Line new stations are currently being built at Panchsheel Park, Chirag Delhi and Greater Kailash. Of these the Greater Kailash metro station located directly opposite the Savitri Cinema is worth taking a look at. The station on the North side of the road flanks the flyover on the road turning into Greater Kailash II and Chittaranjan Park to the South. The residential colonies across the Outer Ring road, is the area from where the bulk of the metro rail users will come (see attached illustration). 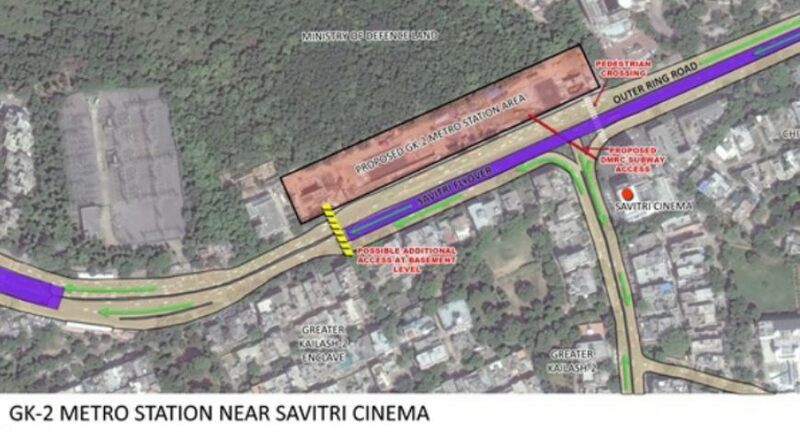 The station as being built proposes one narrow underground tunnel access opening on to the pedestrian sidewalk on the corner of Savitri Cinema. This constricted entrance is the only access from the South side of the Outer Ring road, other than the pedestrian crossing at road level. The existence of the adjoining flyover makes it impossible to think of any kind of overhead connection to cross over. However, it is still possible to provide another tunnel connection at the western end of the station opening on to a residential lane in Greater Kailash Enclave II. This would to a large extent ease pedestrian access and exit from the metro station. The station is being built on land acquired from the Ministry of Defence, whose vast underused area, extends all the way up to Greater Kailash I. The station has a minimal setback from Outer Ring road, which carries an enormous amount of vehicular traffic. Any parked vehicles near the station will create havoc all along the road. The DMRC is proposing to provide a traffic lay-by at the back of the station, where scooter rickshaws and taxis will be diverted and parked. This is a proposal, which in terms of current traffic behavior is unrealistic, as it would be almost impossible to enforce. This situation has all the makings of serious problems both for the metro users, and for vehicles using the Outer Ring road. In addition the location of the station will make it difficult to consider road widening in the future to meet increased traffic demand. According to DMRC, the cost of acquiring land is a serious constraint. In relation to this there are a number of issues that need careful consideration. First and foremost is the fact that mass transportation systems in all cities are not something that you build every day, and systems as implemented are expected to serve future generations. Keeping this in mind the current cost of acquiring additional land may well be justified to effectively serve future need. 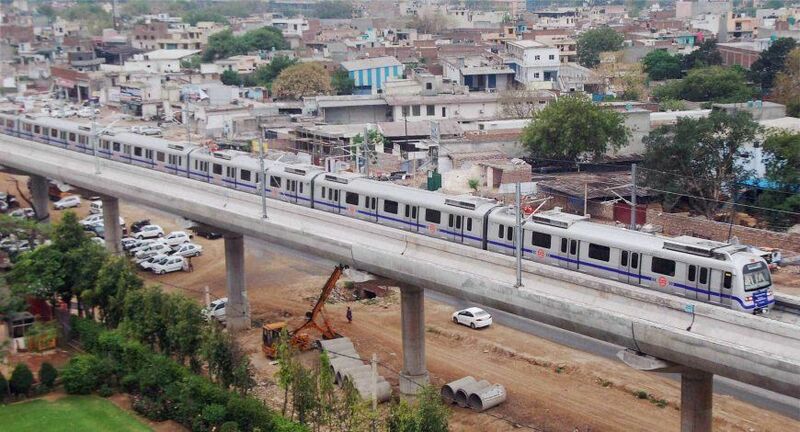 The second and more important issue is the fact, that in Delhi even today the metro rail and the city bus services together, currently meet the transport needs of a major section of the urban population. The total number of people using these services is more than double the number of persons in private cars and taxis that have taken over the road network. Roads across the city occupy enormous areas of urban land, which is steadily being expanded with the addition of new flyovers and bridges. Government agencies assist in acquiring land for this purpose, and also sanction large amounts to cover construction cost. It should now be recognized that the metro systems and bus services together serve much larger sections of the urban population, and therefore should be given greater importance. More government support should be extended to acquire substantial areas of land around metro stations to improve overall conditions. Had DMRC taken a decision to push the location of the Greater Kailash station back from the road by an additional 100 feet or so by acquiring more land, it would have been in a better position to address future congestion issues. As part of the overall integration of the metro system with the framework of the city, major metro stations need to be identified and planned to have direct connections to surrounding residential areas by a bus network, as well as a system of vehicular roads, bicycle tracks, and pedestrian footpaths. Certain metro stations are going to be major nodes and points of interchange, from one mode of transport to another. These nodes need to be identified. The most important metro stations in this respect are those, which connect to one or more bus systems. The transfer of passengers from the metro to the bus services needs to be smooth and efficient. Such nodal interchanges will need land to accommodate bus terminals, along with areas for taxis, auto-rickshaws, and private cars, as well as careful detailed planning. The effective linkage of the metro with other modes of transport is essential, otherwise much of the advantages of the mass transportation systems extending across the city will gradually be dissipated. The problems referred to above in relation to the Hauz Khas and Greater Kailash metro stations are common to a fair number of stations on the Delhi metro network. It would be good if the DMRC were to carry out a systematic review of all the stations on the network and initiate corrective action over a period of time. Such a review would also help DMRC prepare a comprehensive list of issues that need to be considered in the planning of future extensions. Such a study would also be invaluable in relation to the fact that DMRC is currently a consultant in the planning of several new metro rail systems for major cities across the country. The present division of responsibility for different transport systems amongst different government agencies is a major obstacle in the way of smooth future development. There is an urgent need now to change this framework and bring all transport related development under a Unified Delhi Transportation Authority as was recommended in the Delhi Master Plan 2021. With a unified agency it will be possible to really plan for the future of the city with a clear sense of vision, instead of pursuing a course of fragmented development.